​To say that The Insomniac's Weather Report is exquisitely thrilling poetry doesn't begin to do it justice. Wicked and funny as an encyclopedia of unanswerable koans, elegant as a fifteenth century flowered silk kimono portraying, perhaps, "a hinge on a hingeless door," it is also savage--containing a hidden history of "marriage,/ perpetual stagger of desire/ and resist"--and I found it irresistible, as will you, dear reader. This book begins: All poems should be about water. Goodfellow follows herself, shadows herself, watches herself as if herself is herself and all else. She follows her lead: lay awake trying to say what about. Elemental everything (water, fire, earth, air, time & eternity) appear here in all of its paradoxical insistence. It's almost as if we are given the ambiguous gift of a parallel family life, a family full of mysterious strangers, smart, greedy for knowledge, adept with music & the persistence of language. Jessica Goodfellow's poems keep secrets. This is necessary to keep her readers safe. At moments her poems are as dangerous as yellow feathers that combust in the mouth. Other times they are as precarious as umbrellas spun from glass. Always they scratch at the door of the sacred, nudge it open a crack, peer in. The world her poems reveal is the natural world revisioned, where waterfalls "sieve body from soul" and rivers indulge in glossolalia. They tempt us with luxurious language, bid us to enter and lose ourselves in the intricate mazes that Goodfellow creates. But be careful. "Some bodies are never recovered." 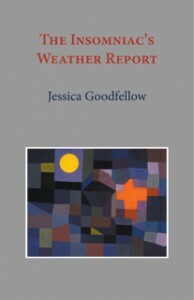 ​Jessica Goodfellow's debut collection...is admirably diverse in its approach and structures and reads like "a fugue of opposites," integrating the scientist's persistent inquiry and the philospher's rarefied obsessions with this poet's highly tuned and unique sensibility "in a blaze of form and discontent." With their keen intellect and capacity to hold ambiguity, Goodfellow's poems are most successful when their complex abstractions are grounded in the body, image, and the human. For this reader, the power of these poems inhabits that space where logic and reason fail, efforts to name and to place break apart, and chaos threatens to annihilate. from the purest cerulean blue. surrounded by blue blue Time. I am THRILLED to announce that Japan-based Isobar Press has issued a NEW EDITION of the book as of June 2014. Copies are available from Amazon.com, Amazon.co.jp, Amazon.co.uk, and by emailing me from the Contact Info page of this site. Readers in Japan can order one of the few leftover three candles press copies directly from me by sending me a message.